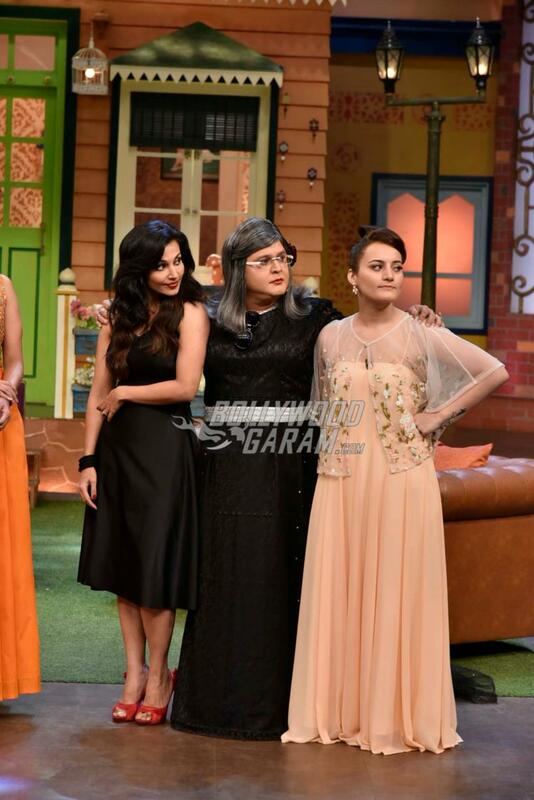 Team of Begum Jaan have a blast with Kapil Sharma on his Show! 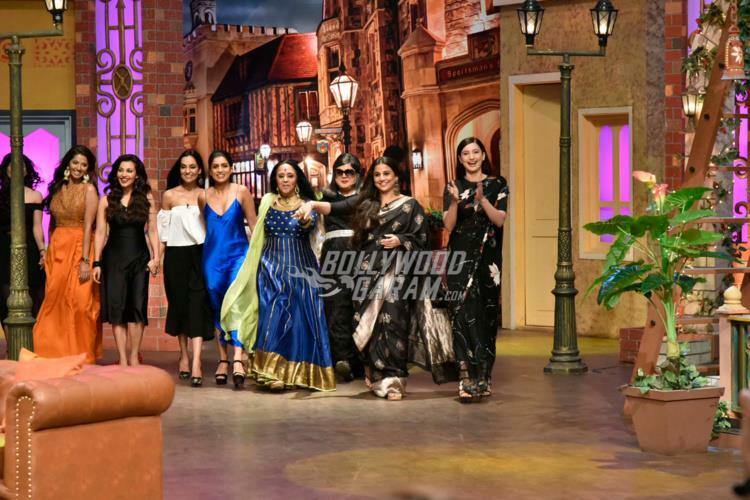 Cast of upcoming movie Begum Jaan visited the sets of The Kapil Sharma Show in Mumbai on March 7, 2017. The makers of the movie have kick-started the promotions of the movie which is all set to hit theatres on April 14, 2017. The sets of the comedy show saw Ila Arun, Vidya Balan and Gauhar Khan promoting their latest women-centric film together. Vidya as usual, looked pretty in a black sari and completed her look with big earrings and a nose ring while Gauhar, too opted for a black sari paired with her famous long mane. Singer Ila Arun was seen in a blue and green anarkali outfit. The show host, Kapil Sharma had a great time along with actor, Ali Asgar. 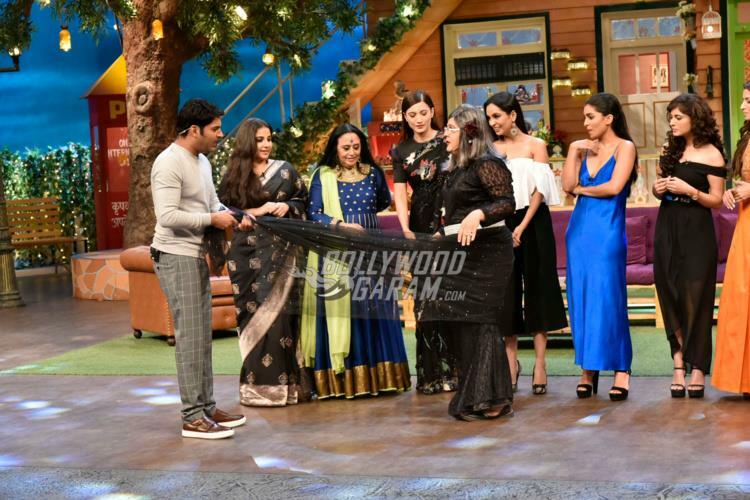 You can very well expect the ‘Begum Jaan’ episode of The Kapil Sharma Show to revolve around dominant women pulling Kapil Sharma’s leg! Upcoming movie ‘Begum Jaan’ is directed by National Award winning filmmaker Srijit Mukherjee and is produced by Mukesh Bhatt, Vishesh Bhatt and Play Entertainment. The makers of the movie recently released the first poster of the flick that featured Vidya Balan. Vidya, in the upcoming movie will be seen playing the role of a madam of a brothel. The movie is set against the back drop of the post-Indian Independence period of 1947. The ‘Begum Jaan’ poster had a tagline “My Body, My House, My Country, My Rules”. 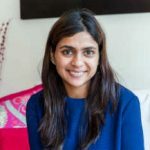 The movie also stars Rajit Kapoor, Naseeruddin Shah, Vivek Mushran, Ashish Vidyarthi, Chunky Pandey, Ridheema Tiwari, Poonam Singh Rajput, Mishti Chakraborthy, Sumit Nijhawan and Rajesh Sharma. Vidya, in recent times has played some hard-hitting roles. Balan’s look in the ‘Begum Jaan’ poster was appreciated on social media by a number of Bollywood personalities. Stay tuned for all the juicy updates from Kapil Sharma’s Show exclusively on Bollywood Garam! Previous articleIBFW 2017 Photos - Richa Chadda, Kriti Sanon Turn Showstoppers on Day 2!